The Sound Quality sounds pretty good with no distortions, Dialogue is clear and Gun Shots sound realistic. The Picture Quality is good not great thanks to darker scenes. Colors pop and well light sections are pretty sharp-looking. Darker shots you get more film grain then usual and one portion of running in the dark during a shoot out we got a ghosting effect. 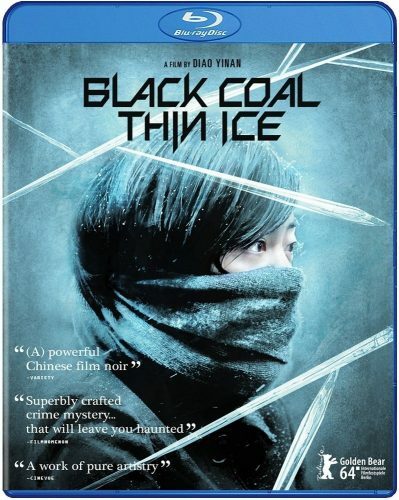 Black Coal Thin Ice is Visually artistically shot with colors and camera angles. Story wise the film is heavy on the viewer with little dialogue throughout the film but did feel realistic. The story was good but I feel the film might be a little long due to the amount of Dialogue. I liked the way the film was shot and at portions had me thinking about the shot as if I were a film maker. Yes the story is good but could get boring depending on your mood, action wise the film only had a few scenes of a shoot out and a few guys getting killed. Hey it’s not an action film I know but a little more of the killer taking an ice skate to at least one more person would have helped along with a little more dialogue and the film would be rated higher. Now The film gets good reviews and even won awards beating Boyhood at one and I’m not saying this is a bad film but for me its was OK.
What I enjoyed the most was the way the film was shot and how it looked. We get a little bit of action some plot twists and Mystery. Overall the film was a good watch and I did enjoy it just wished we got more Dialogue and a little more emotion but I assume that’s what the film was going for as it is Artsy in the way it’s filmed. With that said I give the film a 3.5 out of 5 and I feel if your mood is good or If you like Stylized films and great film making, check it out.